9-1-1 is a phone number that connects you to emergency ambulance, fire or police assistance. This emergency phone service is available throughout Huron County and most of North America. Call 9-1-1 whenever you or someone with you is in a life-threatening situation. These situations include when someone needs emergency medical help, to report a fire or a crime in progress. if a child has diarrhea or vomiting, won’t drink and is at risk of becoming severely dehydrated. Remember: If you have any doubts, call 9-1-1. The paramedics will take you to the appropriate emergency department. If you call 9-1-1 by mistake, stay on the line to tell the 9-1-1 operator that everything is okay. If you hang up before speaking with the operator, they will call you back and/or dispatch a police vehicle to investigate the situation. Do not call 9-1-1 for non-emergencies – it takes services away from people who do need them. The 9-1-1 operator will ask if you require ambulance, fire or police assistance. Your call will be quickly transferred to the appropriate emergency dispatcher. Stay on the line and be prepared to answer all questions asked; answering questions does not delay emergency response. For medical emergencies, be prepared to answer the questions related to the patient’s condition. What is the address or location (e.g., main intersection) of where the patient is located? What phone number you are calling from? Stay on the line until the 9-1-1 operator tells you it’s okay to hang up. Make sure you and your children know your complete address and phone number. If you live in a town or village, know the name, street and house number. If you live in a rural area know your municipality, road name and civic address number. Residents should regularly check to make sure their civic address number is clearly visible from the road. if you live in an apartment, try to have someone meet the paramedics at the lobby door. Make sure your civic address is visible at all times. How do I order a new or replacement civic address number for my rural property? Contact your local municipal office. 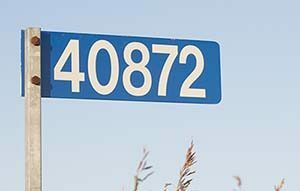 I live in an urban area, are there specific requirements for the size and placement of my house number? It is recommended that your house number be at least 5 inches in height and be made of reflective material. The placement should be on the front of the house or building facing the roadway. Do not place the number where it may become blocked from view by a vehicle, foliage, seasonal decorations or snow. For some properties, it may be wise to place one number at the roadway on the privacy fence or gate and one number on the house itself. This address can be used by others for reporting an emergency involving your property or for those requiring assistance on the roadway.